From Washington to Trump, these are the stories of each president's childhood told through fragments and quotes appropriated from more than 300 children's books, pop history books and scholarly biographies. Together, it's also the story of boyhood in America, a series of portraits that illustrate how growing-up has changed and the hurdles have shifted. 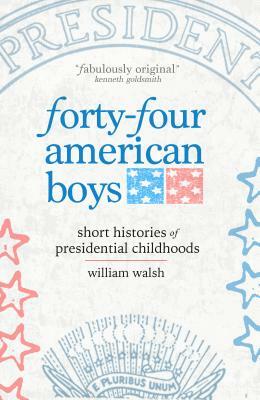 From farm boys to aristocrats, these are America's origin stories, the legends of our leaders--a compendium of folklore and facts about the roots of American power. William Walsh is the author of Ampersand, Mass. ; Pathologies; Questionstruck; and Without Wax: A Documentary Novel. His stories and texts have appeared in Annalemma, Artifice, Caketrain, Quick Fiction, Rosebud, New York Tyrant, Lit, McSweeney's Internet Tendency, Juked, The &Now Anthology: Best of Innovative Writing, and Dzanc Best of the Web 2010. He currently lives in Boston, Massachusetts.